This is a picture of the Hubble Telescope eXtreme Deep Field. The Hubble Space Telescope made this image by finding the darkest possible patch of light in the sky, exposing the camera to it for 50 days, and seeing what came out. This picture proves that you have absolutely no idea how vast the universe truly is. The universe is so vast that you couldn’t possibly perceive what ‘vast’ means in this context. I will prove this to you using simple numbers. Start by trying to imagine the number one trillion. Go on, try. It’s only a thousand, thousand, thousand, thousands. If you aren’t able to do this, try thinking of a pack of Oreos. There are 30 Oreos in a pack and each pack is about a 1x1 square foot. If you had 1 trillion Oreos you would have a large sugar rush as well as 33 billion packs of Oreos. You could arrange these packs of Oreos into a 35x35 mile square, approximately half the size of long island. Now, back to astronomy. In our home galaxy of the Milky Way, there are approximately one trillion stars. Your Oreos, which are currently smothering half of Long Island, each represent a star. That is how many stars are in our galaxy alone. Keep in mind that our galaxy is a fairly average sized galaxy. Look at the Hubble eXtreme Deep Field again. This is an image of galaxies that are near the very edge of our universe. We can’t see them with the naked eye, but they surround us within every crevice of dark space you see in the sky. The image itself contains 5,500 galaxies. Even if a point of light in this image looks like a star, odds are it’s a galaxy. If we assume that every galaxy in this image has about the same number of stars as the Milky Way, then the total number of stars contained within this image is about 5.5 quadrillion. If each of these stars is an Oreo in an Oreo pack and you arrange all of these packs in a square, one edge of your square runs from Pittsburgh to Los Angeles. 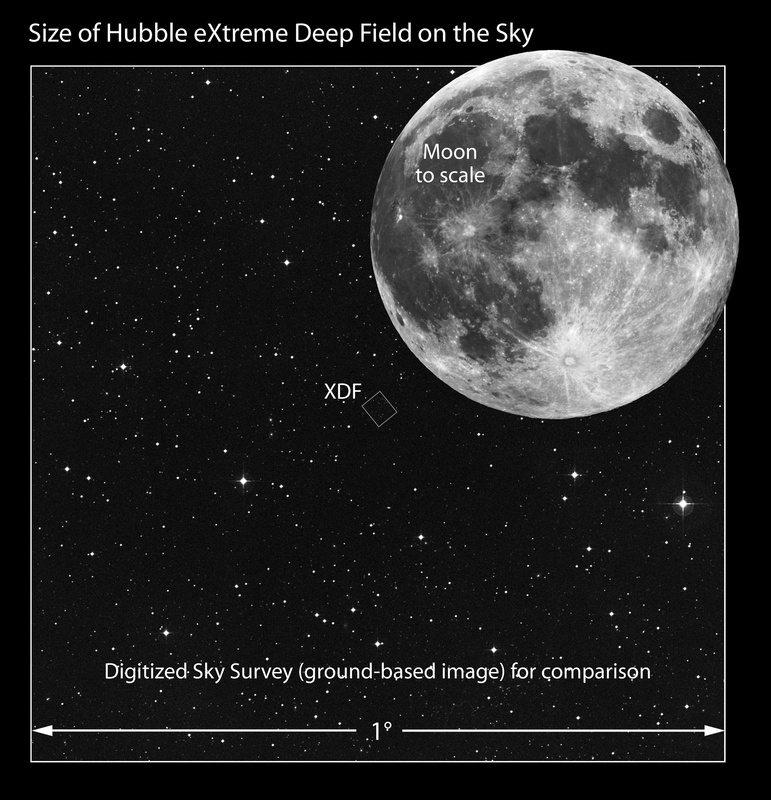 You should also know that the full picture (shown here) spans an area of the sky that is only a fraction of the size of the moon (see image). Images just like this one surround us in every direction. That’s a whole lot of Oreos.